Louisa Dress - Compagnie M.
You guys, I found it! After looking really hard and dabbling with different ones, I finally found the perfect dress pattern for little girls!!! The Louisa dress is perfect for so many reasons, not least because it has multiple cute versions (with different back, sleeve and side options), can be fully or partially lined, and covers ages 1 to 10. You could literally make 10 dresses for the same little girl throughout the years and they'd all look so different! For my version of Louisa I used some chambray and lightweight cotton from my stash, and I also decided to give piping a go for the first time ever. I might be biased, but I think the end result is super cute. In fact, I'd love an identical one in my size! I think I traced out the wrong sleeve size though, as I ended up having to put a pleat in each one. It's no biggie though as the pleats look pretty sweet. What I would say though is that I found setting in and hemming the sleeves tricky on such a small scale. Next time I think I'll try hemming and setting the sleeves in flat. My Louisa will mostly be worn during the summer, so I opted for partial bodice lining, but the excellent instructions take you through fully lining the dress for colder weather. The Compagnie M. pattern is drafted beautifully and it fits the 3-year old madam I made it for perfectly. My one piece of advice would be against getting the PDF version, simply because you'll spend an eternity tracing. The pattern has quite a lot of pieces and if you plan on making different versions for different ages, you'll regret it. I know I'll be using this pattern a lot, so I'm definitely going to invest in the paper pattern asap, and while I'm at it I think I'll snap up the gorgeous Lotta dress too! Edit: The paper pattern is also overlapped sadly...so there's no getting away from tracing! I'm so pleased I discovered Compagnie M. patterns, they seem to be a class above other kids' patterns and I'm a huge fan of their modern take on vintage styles. What do you think? Yes, it's really versatile and fun! The bird print is super cute! And well done on the piping, it's a really nice touch! 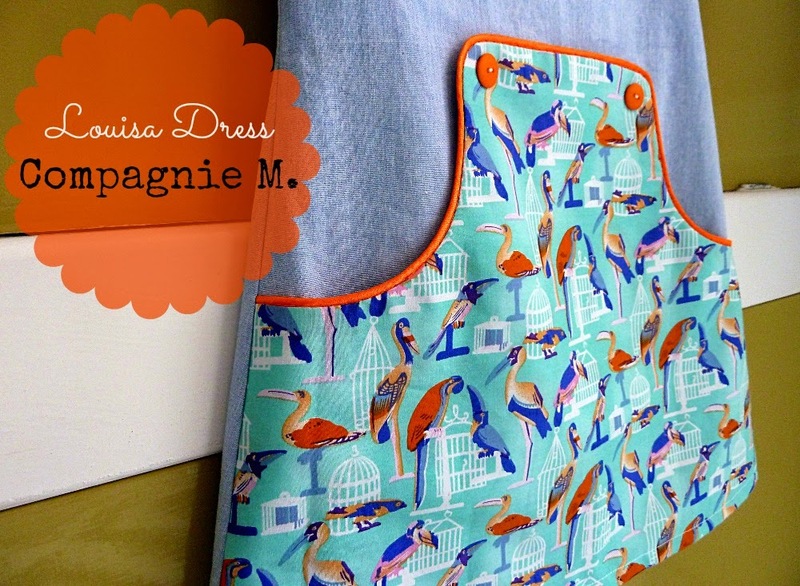 This is super cute, and I love the birds fabric! For kids (and often adults) garments I usually sew the sleeves flat, it's so much easier! This is super cute! I love the birds fabric. For kids (and often adults) garments I usually sew the sleeves flat, so much easier! Thank you! Tempted to make one for your little one? Thanks lovely! Perhaps you'll find something cute for your little boy? This dress is completely darling! I bet the little girl loves it. Will it affect fit sewing sleeves in the flat? If not than I shall be doing that from now on. Toddler sleeves are too fiddly. She sure looked happy in the photos her mummy sent me :o) It shouldn't affect fit at all, as long as you stick to the correct seam allowances. It may affect the order of construction a little, especially if lining. You've made such a beautiful job of it! I traced the pattern off last night and I'm going to start sewing this evening, it's for my goddaughter's 2nd birthday and I feel renewed enthusiasm now I've seen yours! I've never done piping before either...! Oh wow, great minds think alike ;o) I'm sure you version will turn out perfectly! I got into sewing too late! Why didn't I have a sewing machine when my daughter was little? All those cute dresses I could have made! Now she's into black leggings and black t-shirts/jumpers. Desperate. I love the piping on your dress, gorgeous fabric too! Haha, such is life I guess! I get my cute-factor from sewing for other people's kids...could work for you too? Yes they really do, don't they!? Omg adorable! Thanks for sharing. I've never heard of this pattern company and I think imogen needs a lot of their patterns. I love the pocket on this dress. I can see a winter version in her future. This is SO cute!! The buttons and piping remind me a little bit of a dress I had (and loved) when I was about 4. Love this pattern you can go to town choosing coordinating fabrics. The piping really makes this dress. Very cute dress. I've made the Lucy dress from the same designer and have been sewing for Kids Clothes week. Check out my blog to see my toddler dress. Wow, love what you've been making for Kids Clothes Week! This is SUPER cute! I love the fabrics you chose! Oh by crikey there is nothing but perfection here! Love it!